Just about a month ago the IEBlog published a post to allow business to manage the update schedule for Internet Explorer 10. It says "this approach lets organizations control when they are ready to deploy IE10 to their Windows 7 users." I took from this that IE10 on Windows 7 was imminent. Today it's out. You can download IE10 for Windows 7 now. The details are over at the IE blog. In the next few weeks and months Windows 7 machines will get automatically upgraded to IE10. For Web Developers like me, that means that between Windows 8 which already has IE10 and all these Windows 7 users who will now have IE10, that more people will have a modern browser than ever before. Once you've upgraded to IE10, go check out some of these sites. Be sure to view the source! http://ie10bethethief.com - Robert Kirkman from Image Comics (You know him from The Walking Dead) also has a great comic I get each month on Comixology called Thief of Thieves. setImmediate API to improve performance and power consumption on tablet devices. SetImmediate, like setInterval and setTimeout, is a timing API and requests the CPU to process the instruction as soon as it’s possible to. Atari Arcade - Lots of classic Atari games, remade using HTML5 and Touch on the web. Pulse - Very cool news aggregator done entirely in HTML5 with support for swipes and multi-finger gestures. Also works nice on mobile phones with responsive design. If you're an ASP.NET developer, make sure you're ready for IE10. The easiest way is to upgrade .NET 4 websites to .NET 4.5. It's an in-place upgrade. You also get the major CLR performance improvements as well. There was a bug about 18 months ago with _doPostBack that was pushed out on Windows Update long ago but it is always good to double check. ASP.NET 4 sites can have trouble with the ASP.NET Web Forms ImageButton control and IE10. You can fix this issue in one of three ways. Check out http://www.modern.ie for regularly updated Virtual Machines and test tools. I try to use BrowserStack whenever I can, as it integrates into Visual Studio with the new ASP.NET and Web Tools 2012.2. The download link doesn't seem to work, I've tried it from IE9 and Chrome and it doesn't do anything. Anyone else have any luck? Bob - refresh and try now? Is it possible to install alongside IE9 for testing purposes? That worked - thanks! I'm really glad that Microsoft released this for W7! The link is not working for me either, tried several browsers and no luck link just refreshes page. Thanks Scott!!! Now lets just force the update on the world TODAY!!!!! I wish the IE team would improve the debug tools. They are vastly inferior to those in Chrome. I also wish IE would move to an agile, incremental release strategy like every other browser. To placate nervous businesses, just have "long-term support" releases (as Firefox does). Sam - what deficiencies do you see in the F12 tools? I switch between them and chrome and they are very similar. Scott - the problem with IE tools is this: We need to support IE8, and when we get an IE8-only bug, we can only use IE8 dev tools - which aren't very helpful. - Ability to break on DOM modification of specific elements (ala Chrome). - "Refresh page to see messages that may have occurred"/Start capturing network traffic. Why does this all need to be explicit? I should just turn on "developer mode" in some setting somewhere and it should capture/log all this by default. - Ability to see applied vs defined styles and how styles are overriding each other. I posted this list on IE team blog as well. That's great news, Scott! This will help many users see the web world much clearer. 1. Unable to support CSS3 rotation. 2. Unable to support CSS1 square bullet. 3. Compatible mode seemed to be worse than IE9 (it could have been rolled back to IE8). Is there any fix? my client is eating me. What about the folks still on Vista? I bought my laptop in 2008, pre-installed with Vista Home premium. But going with what I said at the start, if nobody cared about Vista it's not a problem. Maybe you should upgrade to Linux? It seems like Microsoft provides more support for it than Vista (see above). How far down the Internet Explorer chain is considered good practice to support in current apps? I will have to say here, as web developers who have to support IEx and greater - not being able to run multiple versions at same time is a real PITA. (Last time I used IE10 on Windows 8, it wouldn't scroll down the full page of 2 out of the 3 sites I went to, so I installed Chrome). to run VM's every time you have to test a localhost web app for IE9, 8, 7 is a PITA. It's not dev friendly. I'm a multi-browser user depending on the tasks I'm performing. Win 7 x64 system at home. IE is still the default system web browser. I use the latest public Firefox browser due to the particular Add-on's I run to help with technicals/blogging work. I also run ChromeDev when I have some compatibility issues with some sites. I don't really do Safari other than have it available for comparative purposes. Anyway, was running IE9 on my Win7 system and have played with IE10 in a Win8 VM and found it pretty nice and snappy. So when I saw all the news about IE 10 for Win7 release I jumped on it. Followed the Exploring IE Blog notice to the download IE10 link provided which turns out to be a "beautyoftheweb" MS website. From there I downloaded the offered IE10 installer file (IE10-Windows6.1-en-us.exe w/o Bing options) and ran it. Installed and rebooted with no issues and I was up running on IE 10. Hurray! Update #1 was "Cumulative Security Update for Internet Explorer 10 Release Preview for Windows 7 for x64-based Systems (KB2792100)"
Update #2 was "Internet Explorer 10 for Windows 7 for x64-based Systems"
Update #3 was "Security Update for Internet Explorer 10 Release Candidate for Windows 7 for x64-based Systems (KB2797052)"
Reboot. Re-check. No more updates. Now I know this isn't a forum for complaining about IE-10 or Windows Updating but here are my observations. 1) The IE 10 upgrade for Win 7 binary version I got and applied from the "beautyoftheweb" site download link turns out to have been file version 10.0.9200.16438. Is that important? I don't know. 2) The IE 10 upgrade for Win 7 binary version I downloaded from the "windows.microsoft" site download link turns out to have been file version 10.00.9200.16521. Is that a more important/newer IE 10 for Win 7 file? I don't know. The version number is larger. 4) If I did download the IE 10 for Win 7 final release installer file (which I may not have actually succeeded in doing) what was with the three updates; one being titled "Release Preview", one being "Release Candidate" and the third being "IE 1o for Win 7 x64-based systems"? Shouldn't I have gotten a fully updated and patched IE 10 for Win 7 binary package right of the bat? Again, I'm not complaining (I promise) but it seems like there is inconsistency between some (or more) IE 10 for Win 7 posts pointing to the correct installer binary and this may lead to confusion for users, and maybe them not actually getting the "final" release version fo IE 10 for Win 7. And to check for patches afterwards...just in case. ...and I just noticed your updated IE 10 for Win 7 download link takes us to a third download binary. It appears to be the "full" installer file (rather than one of the web-based "online" installer files I mentioned. I like your link best...wish I had seen it first...it's definitely the biggest binary I've seen so far! Problem still stands as of lots of posts for "Get IE 10 for Win 7" pointing to different MS download sources without consistency of binaries. Is it true that 10 doesnt support silverlight? We have a number of silverlight apps in production where I work that if it automatically loads 10 and removes 9, then production systems will stop working. O.K Great but, this problem with VS 2010 SP1 still exists !!!! Attaching the Script debugger to process ' iexplore.exe' on machine '037F02X825033C4' failed. A debugger is already attached. What is the solution for this one ???? Rick, Silverlight works just fine in IE10. Blue Screens my laptop navigating certain sites. Reason is page faults. The first link you gave is PREVIEW VERSION!!! (At least when I go there with win7 Polish edition).When I go to IETestdrive and choose AudioExplosion demo it tells me that I don't have browser supporting MSGesture APIs, Pointer Events... When I click learn more it takes me to browser update page and when I click update it tells me that I currently have newer version. LOL Microsoft. That is pathetic. And I'm saying this being MS fanboy. Ditto what Mohamed said. The "Attaching the Script debugger to process" is a killer for me. I am on Windows 7 and VS 2010 and have not found any acceptable workaround short of reverting back to IE 9. I was excited to get IE 10 on my Win 7 laptop, but this is a killer for me. Back to IE9 I go. I think that MS loose many many customers if that stupid Script debugger problem with IE10 and VS2010 will not be resolved soon! I have tried @Dmitri simple fix. But still the error is not resolved with IE10 & VS2010 on Windows7 32-bit OS. "Attached the Script debugger to process ' iexplore.exe' on machine 'MyMachine' failed. A debugger is already attached." I also get the script debugger error with VS2010 same as Kapil and also the jquery ajax post issue both of which are causing me serious problems. Is there a relevant MS Connect bug report I can follow or anything? 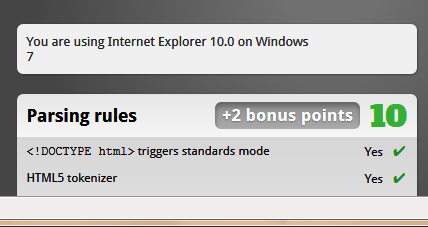 I got the same script debugger issue as well, tried couple workaround but nothing worked, i have to downgrade to IE 9. Microsoft has put too much efforts to advertise the new IE but even couldn't make it work with it's own product (VS 2010), what a shame! I went to the web site and clicked download, it started to download, but failed. There is a dialogue box "Internet Explorer did not finish installing- Setup can't continue because a more recent version of internet explorer is installed on your computer" And I have IE 9 in my 32-bit Windows 7 PC. Can you help me out Scott? I am really excited to see IE 10. I just wanted to thank you for the free Baby Smash! Keyboard game. I have been looking for something like this, and yours is better than the other 2 i found first. I would like there to be better sound. Is there a way I could put my own sounds in there if i recorded my voice or something? that would be a great function to add. I wish i knew how to program. If parents could easily insert their own pictures and sounds. If anyone knows of anything like that out there please let me know. eric.cosmopolitancleaning@gmail.com. Thanks. and I'll get someone looking at them. I have Win 7 with automatic updates - the equivalent of SP1, but not installed as a package. When I try to download IE10, I am told I can't since I don't have SP1. If I roll everything back and install SP1, I'll lose all my other updates. Any suggestions? In the F12 tool I do not see svg elements and paths in the DOM tree. (Win 7 64, ie10) Am I missing a setting or something? .. I mean, I don't see any svg information beyond the svg and g tags; meaning, no path data, text fields, etc. In building animations this is critical debug information. Also, the historic and well-documented IE z-index handling issue remains. All that equates to 3 major browsers (Firefox, Chrome, Safari) implementing a complex site perfectly but not IE. And the browser's debugger is not sophisticated enough for me to hack an IE solution to the problem. I like Microsoft and their accomplishments. But being non-compliant makes advancing new technologies difficult especially when it's Microsoft who is the culprit. Come on, MS. You've led the way this far, what's up with not resolving some of these bugs that have been documented for years now? After installed IE10 for Windows 7 I was unable to signin to Google Apps, e.g. google apps mail url responded with wrong (gmail) signin screen. Sorry IE10 is another bad product forced into the pipeline! Kills Aero on some Win7 machines, rendering flaws with Flash video, can't render HTML correctly like IE9(search StackOverflow)... WOW! Microsoft never used to have bugs this visible in a released product before, some show stoppers! I was all primed to go back to IE as my dev browser(Chrome is now for speed), but I can't use or recommend IE10! Win 7 was IE's big chance, since I don't know a single business that has even a passing interest in Win8! I just keep shaking my head, what's wrong with Microsoft? Installed it. It killed SQL Server Management Studio, which now won't load because I need "Internet Explorer 6.0 or later". The most important feature the IE is missing for years, are add-ins like noscript or ad-block, for firefox. And a few others, but we simply cannot use IE because we have no control on what is loaded. Noscript, ad-block and few others let the user control almost anything inside the page and inspect and block anything. So my users and clients, use firefox with add-ons. I would like to use IE10 more. Sadly, it's terrible blurry font rendering means I'll be continuing to use other browsers instead. I found a fix for the issue of Visual Studio 2008 not exiting debug mode after closing IE10: I just re-installed VS2008 SP1. Should have thought of that three hours ago. Nope, it requires Windows 7. A good reason to upgrade! IE10 is working fine for me now! I still can't understand why no "Paste & GO" since it's there on Windows 8. Chris, As soon as you uninstall IE10, IE9 should automatically become active again. Installing IE10 broke debugging in VS2012 where IE is started but won't stop if debugging is stopped, and debugging isn't stopped when IE is closed. Does MSFT actually use or test this stuff? hire professionals that get stuf to work, not wizz kids amazed with the latest shiny objects. No, the latest version of Silverlight does not work with IE10 on Server 2008 R2. Absolute rubbish and means we have to move to IE9 instead of 10. Ridiculous! Someone might know why a WINDOWS2008R2 64 BITS, I get the following message IE10-Windows6.1-x64-en-us.exe is not a valid Win32 application. System Boot Time: 2013-07-18, 9:44:15 p.m. Processor (s): 4 Processor (s) Installed. Re Dave: "Installing IE10 broke debugging in VS2012 where IE is started but won't stop if debugging is stopped, and debugging isn't stopped when IE is closed. Does MSFT actually use or test this stuff? hire professionals that get stuf to work, not wizz kids amazed with the latest shiny objects."